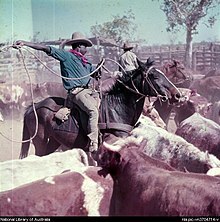 A drover in Australia is a person, typically an experienced stockman, who moves livestock, usually sheep, cattle, and horses "on the hoof" over long distances. Reasons for droving may include: delivering animals to a new owner's property, taking animals to market, or moving animals during a drought in search of better feed and/or water or in search of a yard to work on the livestock. The drovers who covered very long distances to open up new country were known as "overlanders". Moving a small mob of quiet cattle is relatively easy, but moving several hundreds or thousands head of wild station cattle over long distances is a very different matter. Long-distance moving large mobs of stock was traditionally carried out by contract drovers. A drover had to be independent and tough, an excellent horseman, able to manage stock as well as men. The boss drover who had a plant (horses, dogs, cooking gear and other requisites) contracted to move the mob at a predetermined rate according to the conditions, from a starting point to the destination. The priorities for a boss drover were the livestock, the horses, and finally the men, as drovers were paid per head of stock delivered. Drovers were sometimes on the road for as long as two years. Traditional droving could not have been done without horses. The horse plant was made up of work-horses, night-horses and packhorses, with each drover riding four or five horses during a trip. The horse tailer was the team member responsible for getting horses to water and feed, and bringing them to the camp in the morning. A good night-horse was highly prized for its night vision, temperament, and its ability to bring animals under control when a "rush", known elsewhere as a stampede, occurred at night. The standard team of men employed to move 1,200 cattle consisted of seven men: the boss drover, four stockmen, a cook and a horse-tailer. Store cattle were moved in larger mobs, of up to 1,500 head, while fat bullocks going to meatworks were taken in mobs of about 650 head, i.e. three train loads. The stockmen will ride in formation at the front, sides and back of the mob, at least until the mob has settled into a routine pace. Cattle are expected to cover about ten miles (16 km) a day, sheep about six miles (10 km), and are permitted to spread up to 800 metres (half a mile) on either side of the road. Occasionally mobs of horses were moved by drovers. A short camp is made for a lunch break, after which the cook and horse-tailer will move ahead to set up the night camp. A continual watch is kept over cattle during the night camp, usually with one horseman riding around the mob, unless the cattle are restless when two riders would be used. A rush can be started by a sudden noise such as a dingo howl, a bolt of lightning, sparks from a fire, or even a bush rat gnawing on a tender part of a hoof. Drovers tell vivid stories of the totally chaotic conditions that occur when several hundred cattle start a rush at night. If they head towards the drovers’ camp, the best option may be to climb a sturdy tree (very quickly). Many drovers have been trampled to death in a rush, sometimes still in their swags. A good night-horse can be given its head, and will gradually wheel the leading cattle around until the mob is moving in a circle, and calm can be restored. During long "dry stages" extra care will be taken of the stock, and this may involve droving during the night to conserve the animals’ energy. About three kilometers before water is reached, the animals will be held and small groups will be taken to drink in order that the cattle do not rush and injure or drown others. A "cattle train drover" is a person who accompanies a mob of cattle on a train while they are being transported to a new location. The goods trains provide special accommodation for these drovers in specially constructed guard’s vans. Queensland is now the only state to run cattle trains. The first droving over a significant distance occurred in 1836 when 300 cattle were moved by Joseph Hawdon in 26 days from the Murrumbidgee River to Melbourne, a distance of about 480 km. Also in 1836, Edward John Eyre drove stock from New South Wales to the Port Phillip district. As droving skills were developed, more challenging assignments were undertaken. During the late 1830s, settlers began to move into countryside near Adelaide. There followed expeditions to bring sheep and cattle to Adelaide from New South Wales. The first such expedition was led by Eyre, which started in December 1837 and followed the path of Charles Sturt along the Murray–Darling River system. Eyre's party comprised eight stockmen, 1000 sheep, and 600 head of cattle, which started out from Monaro in New South Wales. The party arrived in Adelaide in July 1838. During the following years, the traffic on the Murray–Darling route would grow enormously. At its height, there was an almost continuous train of sheep, cattle, bullock drays, and horses along the route. Many Aborigines lived along the route. They sometimes received "injudicious treatment" from the Europeans—in the words of Governor George Gawler. Such treatment included sexual abuse of Aboriginal women and wanton shooting of Aborigines. That led to an escalating cycle of conflicts between Aborigines and Europeans. For example, drover Henry Inman lost all 5000 of his sheep, when Aborigines attacked his party, in April 1841. And in August 1841, drover William Robinson and his party, together with a policing force, killed at least 30 Aborigines, in the Rufus River massacre. In 1863, boss drover George Gregory drove 8,000 sheep from near Rockhampton to the Northern Territory border, some 2,100 km, taking seven months. In the early 1870s, Robert Christison overlanded 7,000 sheep from Queensland to Adelaide, a distance of 2,500 km. Patrick Durack and his brother Michael trekked across the north of Australia from their property on Coopers Creek in Queensland, which they left in 1879 along with 7250 breeding cattle and 200 horses, to the Kimberley region of Western Australia near Kununurra where they arrived in 1882. The 3,000 miles (4,828 km) journey of cattle to stock Argyle Downs and Ivanhoe Station is the longest of its type ever recorded. Charles and William MacDonald left their property near Tuena, New South Wales, in 1883 bound to establish a new pastoral lease, Fossil Downs Station, in the Kimberley of Western Australia some 5,600 kilometres (3,480 mi) away. They left with 700 head of cattle and 60 horses during drought conditions as they trekked through Queensland. Arriving at the property in June 1886 with 327 cattle and 13 horses they reunited with their brother Dan. The most famous Outback stock routes were the Murranji Track, the Birdsville Track, the Strzelecki Track and the Canning Stock Route. The Canning was regarded as the loneliest, the most difficult, and the most dangerous. The gradual introduction of railways from about the 1860s made some droving work unnecessary. However, the work of the overlanders and drovers in general fell away rapidly in the 1960s as trucking of animals became the norm. Road trains carrying large number of animals are today a common sight in rural and Outback areas. 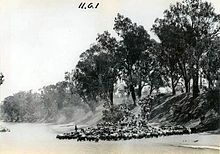 But during times of drought, taking animals onto the "long paddock", the fenced travelling stock route, along a public road, is common practice even today, and droving skills are still required. The modern drover is now typically assisted with modern equipment, such as motorcycles, all-terrain vehicles, a truck and/or trailer for the horses, if they are used. Caravans are commonly used, along with generators to provide extra comfort and convenience. Stock may be enclosed at night in an area that has been fenced off with a temporary electric fence. Localised droving was common in the Kosciuszko National Park and Alpine National Park and High Plains areas, until the areas became National Parks. The drovers would often bring cattle from the lower pastures to the fresh green pastures for the summer months. During the summer months many of the drovers would often stay in mountain huts like Daveys Hut, Whites River Hut and Mawsons Hut. In 1881, Nat Buchanan, regarded by many as the greatest drover of all, took 20,000 cattle from St George in Southern Queensland to the Daly River, not far south of Darwin, a distance of 3,200 km. Cattle stealing has long been part of Australia's history and some of the country's biggest droving feats have been performed by cattle rustlers or duffers. The most notable one was Harry Redford who established a reputation as an accomplished drover when he stole 1,000 cattle from Bowen Downs Station near Longreach, Queensland in 1870 and drove them 1,500 miles (2,414 km). His route took him through very difficult country down the Thomson, Barcoo, Cooper and Strezlecki rivers thus pioneering the Strzelecki Track. Women have been noted as exceptional drovers as well. One of the true legends of the outback is Edna Zigenbine, better known as Edna Jessop, who took over a droving job from her injured father, and became a boss drover at 23. Along with her brother Andy and four ringers, they moved the 1,550 bullocks the 2,240 kilometres across the Barkly Tableland to Dajarra, near Mount Isa, Queensland. Much literature has been written about droving, particularly balladic poetry. An idealised image of the droving life is described in the poem Clancy of the Overflow, and more realistically depicted in the historical film The Overlanders. Nicole Kidman and Hugh Jackman (as a drover) appeared in the Australian period film Australia, set around a droving trip in the remote Northern Territory. Wikimedia Commons has media related to Droving. ^ "Chisholm, Alec H.". The Australian Encyclopaedia. Sydney: Halstead Press. 1963. ^ "Eyre, Edward John (1815–1901)", Australian Encyclopaedia (Michigan State University Press, 1958). ^ a b c d e f Foster R., Nettelbeck A. (2011), Out of the Silence, p. 32-39 (Wakefield Press). ^ "Eyre, Edward John (1815–1901)", Dictionary of Australian Biography (Angus and Robertson, 1949). ^ "Lord Stanley to Sir George Gipps (21 February, 1842)", Historical Records of Australia, Series I, Volume XXI, p. 695-701 (Sydney: Library Committee of the Commonwealth Parliament). ^ "Despatch from Governor Grey to Lord John Russell (May 29, 1841)", Accounts and Papers 1843, Volume 3 (London: William Clowes and Sons), p. 267-272. ^ "The Bench of Magistrates and the Late Fatal Affray with the Natives", Southern Australian, p. 3, 21 September 1841 – via Trove . ^ "Fatal Affray With The Natives In South Australia: Report of Mr. Moorhouse to His Excellency the Governor", Port Phillip Patriot and Melbourne Advertiser, 14 October 1841, p. 2 – via Trove. ^ "Lake Argyle Village". The Sydney Morning Herald. 8 February 2004. Retrieved 25 October 2018. ^ "Register of Heritage Places – Assessment Documentation – Fossil Downs Homestead" (PDF). 1996. Archived from the original (PDF) on 12 March 2012. Retrieved 25 June 2011. Video, September 2013, one of the largest Australian cattle drives in 100 years. 18,000 head 1,500 kilometres. Whole mob is 80 kilometres long. The Canning Stock Route is a track that runs from Halls Creek in the Kimberley region of Western Australia to Wiluna in the mid-west region. With a total distance of around 1,850 km (1,150 mi) it is the longest historic stock route in the world. The Birdsville Track is a notable outback road in Australia. The 517 kilometres (321 mi) track runs between Birdsville in south-western Queensland and Marree, a small town in the north-eastern part of South Australia. It traverses three deserts along the route, the Strzelecki Desert, Sturt Stony Desert and Tirari Desert. The Barcoo River in western Queensland, Australia rises on the northern slopes of the Warrego Range, flows in a south-westerly direction and unites with the Thomson River to form Cooper Creek. The first European to see the river was Thomas Mitchell in 1846, who named it Victoria River, believing it to be the same river as that named Victoria River by J. C. Wickham in 1839. It was renamed by Edmund Kennedy after a name supplied by local Aborigines. A drovers' road, drove [road] or droveway is a route for droving livestock on foot from one place to another, such as to market or between summer and winter pasture. Many drovers' roads were ancient routes of unknown age; others are known to date back to medieval or more recent times. The Flinders Highway is a highway that crosses Queensland east to west, from Townsville on the Pacific coast to Cloncurry. The road continues as the Barkly Highway from Cloncurry to the Northern Territory border at Camooweal and beyond. The Flinders Highway passes a number of small outback towns and typical outback landscape predominates towards the inland. It was known as National Route 78 before Queensland began to convert to the alphanumeric system being adopted in Australia and is now designated as A6. The highway is also known as Overlanders Way. Its entire length is part of the National Land Transport Network. Campdrafting is a unique Australian sport involving a horse and rider working cattle. The riding style is Australian stock, somewhat akin to American Western riding and the event is similar to the American stock horse events such as cutting, working cow horse, team penning, and ranch sorting. In Australia a stockman is a person who looks after the livestock on a large property known as a station, which is owned by a grazier or a grazing company. A stockman may also be employed at an abattoir, feedlot, on a livestock export ship, or with a stock and station agency. The Australian Stockman's Hall of Fame is a museum located in Longreach, Queensland, Australia, which pays tribute to pioneers of the Australian outback. The centre is also dedicated to Australian stockmen and Aborigines who have shown bravery and courage. In Australia, a cattle station is a large farm, whose main activity is the rearing of cattle; the owner of a cattle station is called a grazier. The largest cattle station in the world is Anna Creek Station in South Australia, Australia. Droving is the practice of moving livestock over long distances by walking them "on the hoof". A muster (Au/NZ) or a roundup (US) is the process of gathering livestock. Musters usually involve cattle, sheep or horses, but may also include goats, camels, buffalo or other animals. Mustering may be conducted for a variety of reasons including routine livestock health checks and treatments, branding, shearing, lamb marking, sale, feeding and transport or droving to another location. 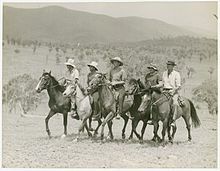 Mustering is a long, difficult and sometimes dangerous job, especially on the vast Australian cattle stations of the Top End, 'The Falls' (gorge) country of the Great Dividing Range and the ranches of the western United States. The group of animals gathered in a muster is referred to as a "mob" in Australia and a "herd" in North America. In Australia, the Travelling Stock Route (TSR) is an authorised thoroughfare for the walking of domestic livestock such as sheep or cattle from one location to another. The TSRs are known collectively as "The Long Paddock". A stockwhip is a type of whip made of a long, tapered length of flexible, plaited leather with a stiff handle that is used when mustering cattle. Henry Arthur "Harry" Readford, was an Australian stockman, drover and cattle thief. Wave Hill Station, mostly referred to as Wave Hill, is a pastoral lease in the Northern Territory operating as a cattle station. The property is best known as the scene of the Wave Hill Walk-Off, a strike by Indigenous Australian workers for better pay and conditions, which in turn was an important influence on Aboriginal land rights in Australia. Edward Bate Scott was a pioneering colonist of South Australia who accompanied Edward John Eyre on several journeys and had a later career with the South Australian Police Force. Stuart Creek Station is a pastoral lease that once operated as a sheep station but now operates as a cattle station in outback South Australia.